Primer 9.3 RC2. back to contents Primer 9.3 RC2 Purpose of Primer 9.3 RC2 LS971 Keywords *PARAMETER Model Merge improvements Customisable definition of. 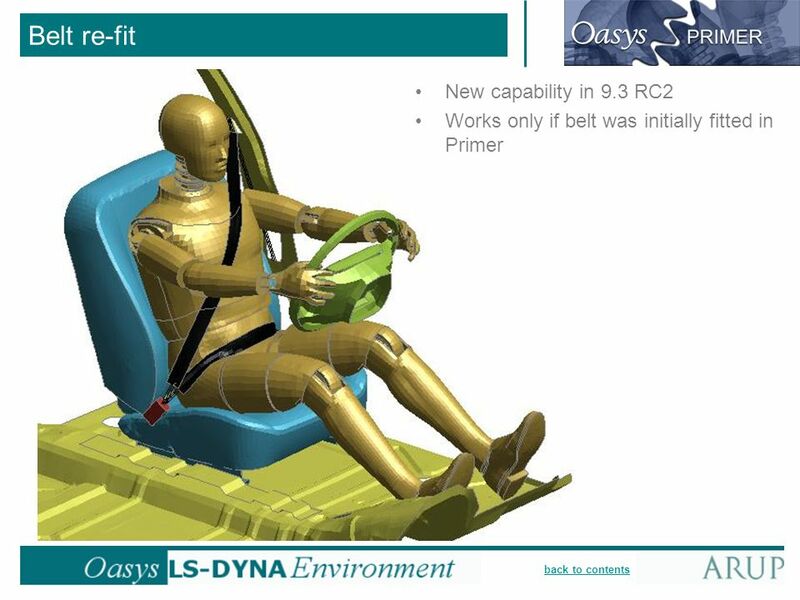 3 back to contents Purpose of Primer 9.3 RC2 The main purpose of Primer 9.3 RC2 is to offer full compatibility with the LS-DYNA manual dated May 2007. 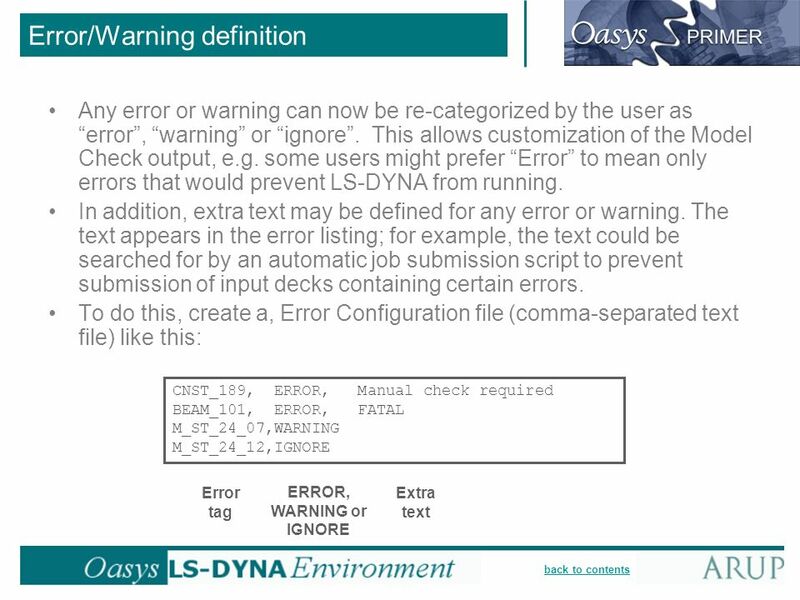 The manual describes LS971 Release 2 (7600), with some additional keywords from Release 3. A small number of new features have been added, e.g. 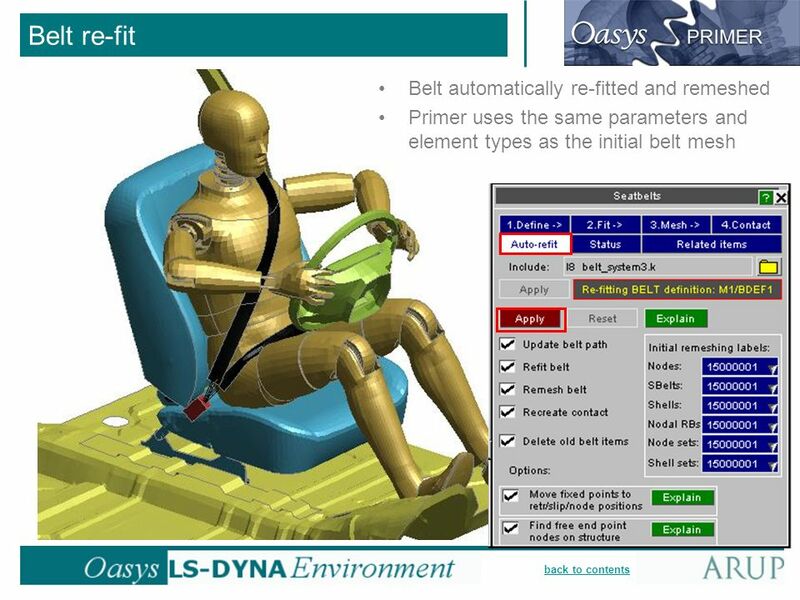 seatbelt re-fit after dummy positioning; background image; and customisable error/warning definition. 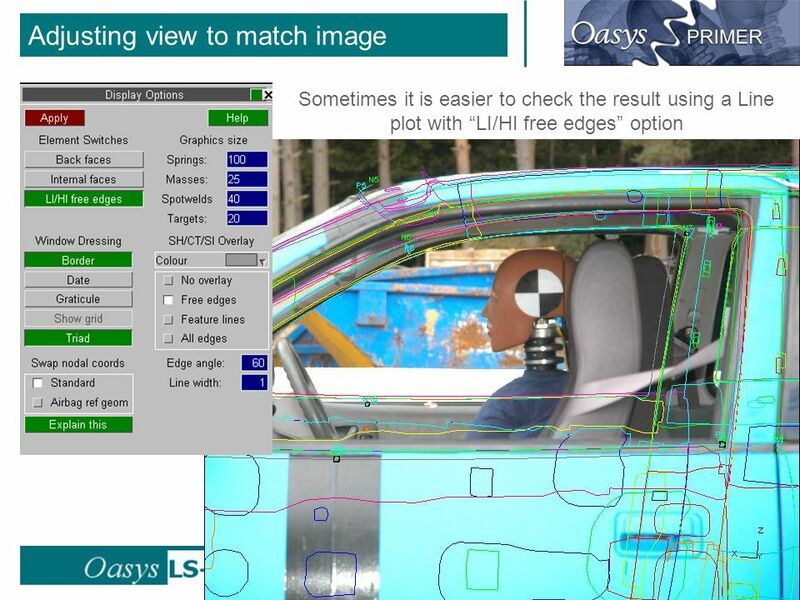 Some existing Primer features have been enhanced in response to user feedback. In addition, some bugs have been fixed – see Release Notes for details. 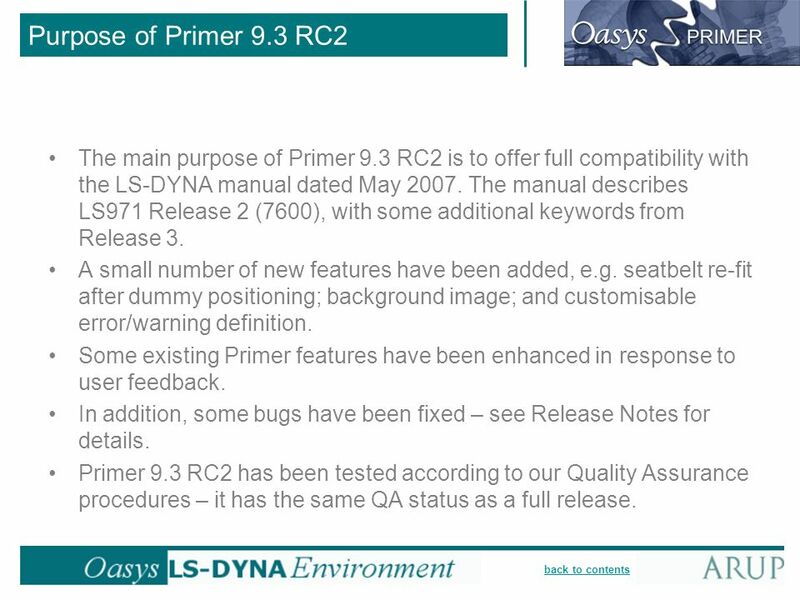 Primer 9.3 RC2 has been tested according to our Quality Assurance procedures – it has the same QA status as a full release. 5 back to contents Keywords Materials, sections, hourglass and equations of state can now be referred to by an 8-character label instead of a numerical ID. 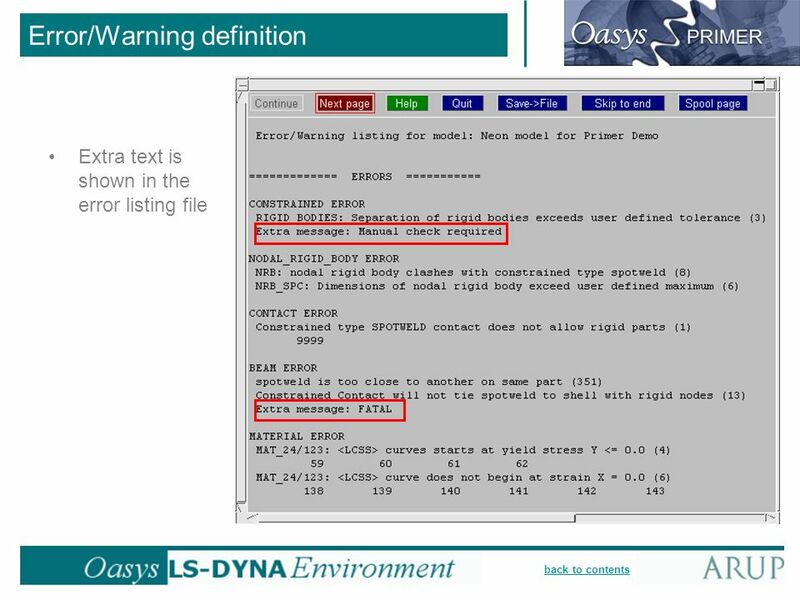 This is supported in LS971 Release 2 and above, and by Primer 9.3 RC2. 9 back to contents *PARAMETER Hover over a text box containing a parameter to see its value. 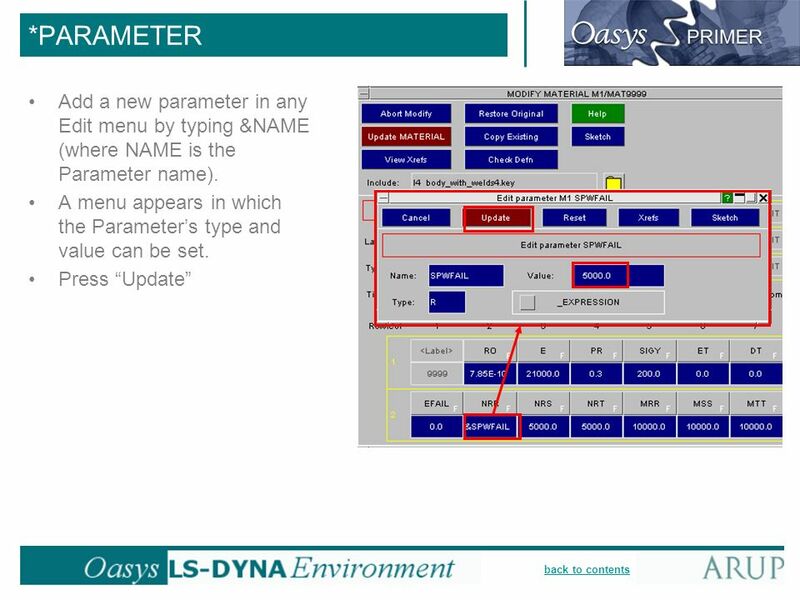 The parameters value or type can be edited from this menu. 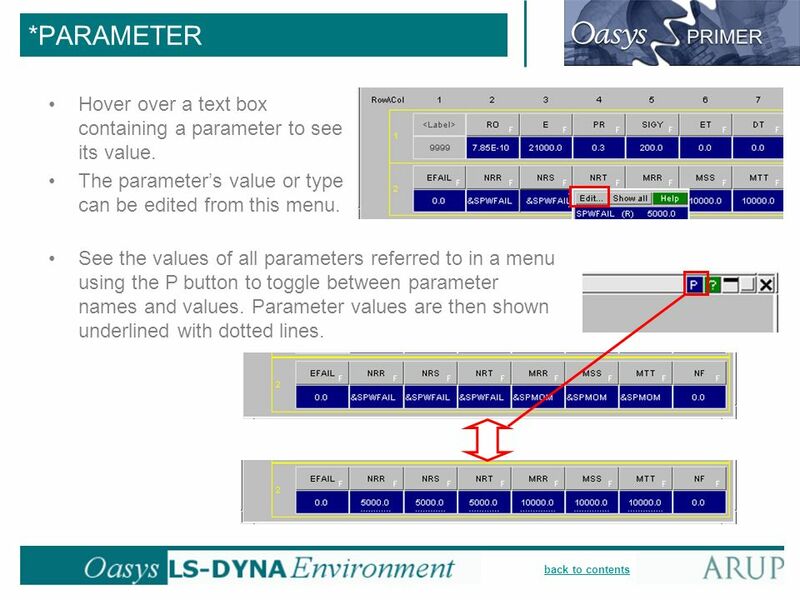 See the values of all parameters referred to in a menu using the P button to toggle between parameter names and values. 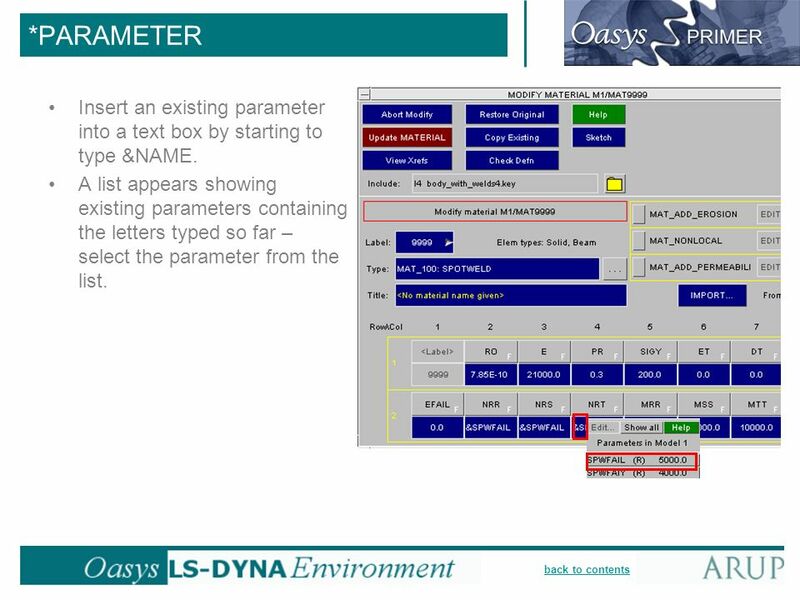 Parameter values are then shown underlined with dotted lines. 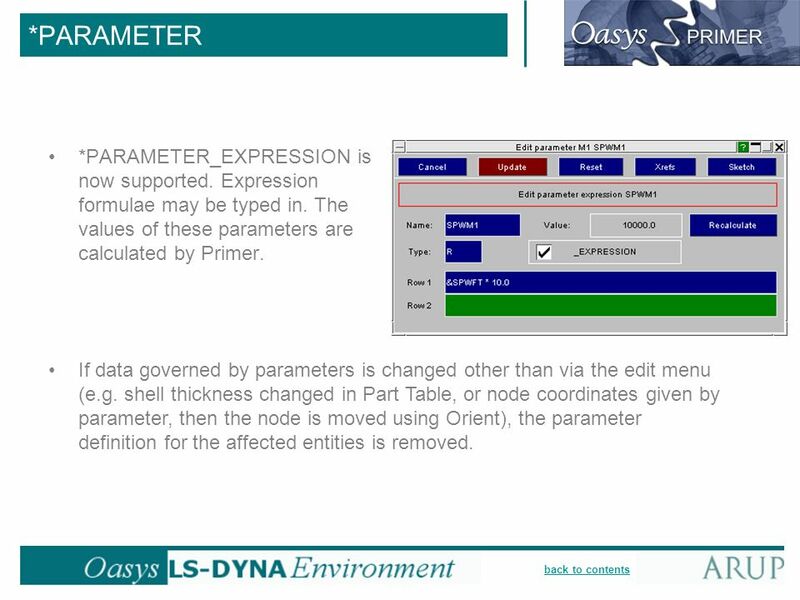 10 back to contents *PARAMETER *PARAMETER_EXPRESSION is now supported. Expression formulae may be typed in. The values of these parameters are calculated by Primer. 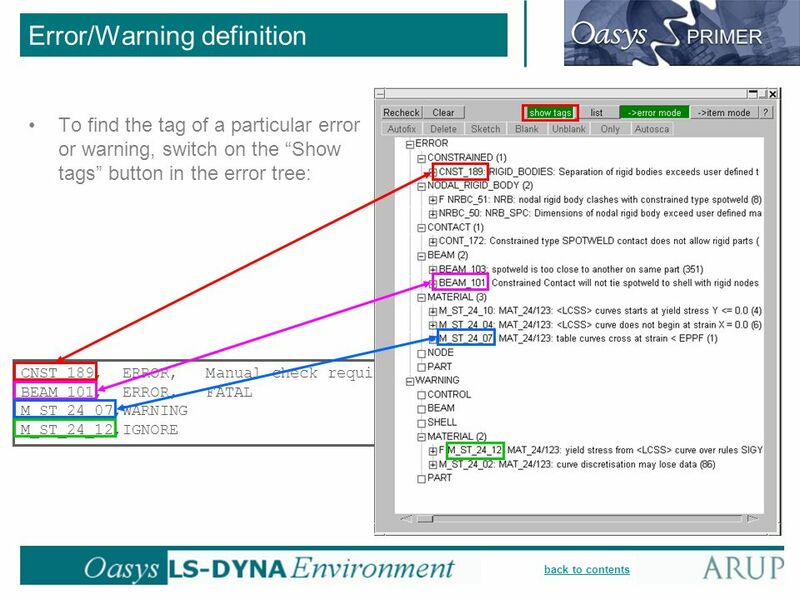 If data governed by parameters is changed other than via the edit menu (e.g. 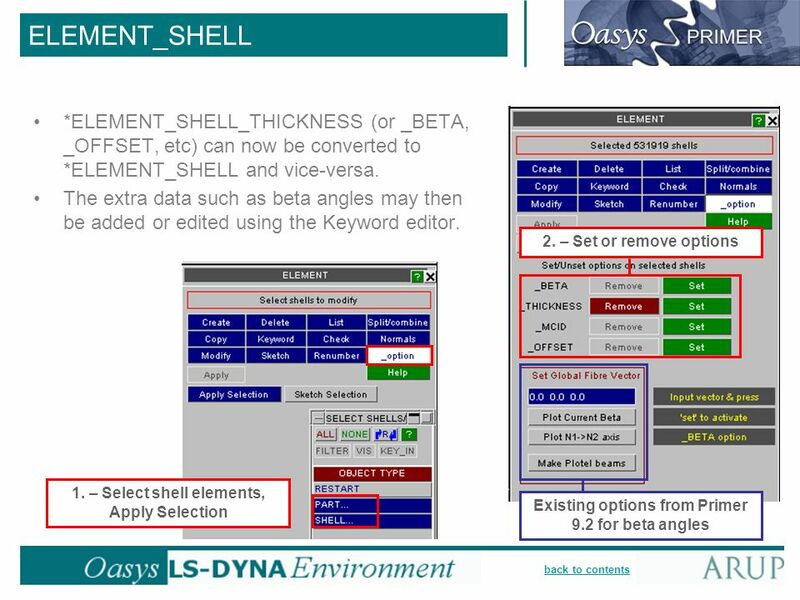 shell thickness changed in Part Table, or node coordinates given by parameter, then the node is moved using Orient), the parameter definition for the affected entities is removed. 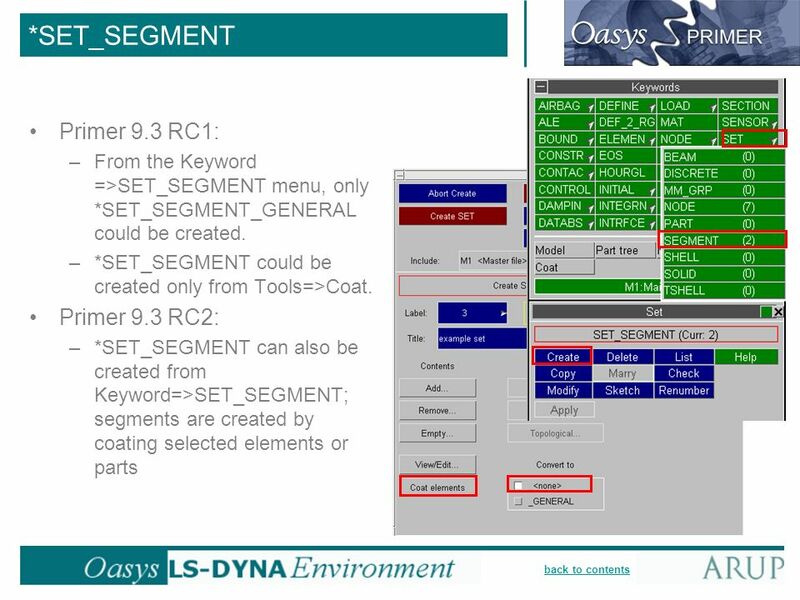 11 back to contents Model Merge improvements Reduced memory option for large models: –The usual method of merging models in Primer is to create a third model from the contents of the two input models, e.g. (Model 1) + (Model 2) = (Model 3). The required memory is the total memory for all three models. Often, Model 1 is very large while Model 2 is small. In this case the required memory is roughly twice the memory needed for a single large model. 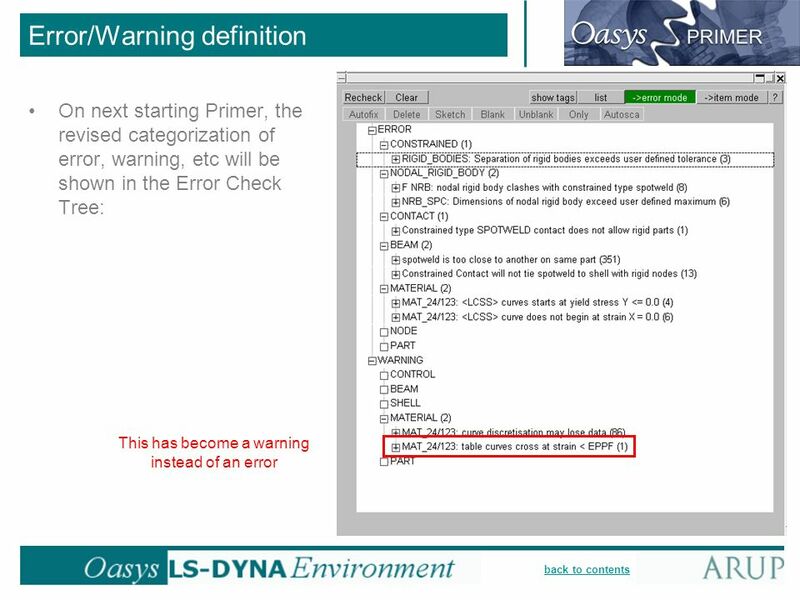 –In Primer 9.3 RC2, a new option has been added: the result of the merge can overwrite one of the input models, i.e. (Model 1) + (Model 2) = (new Model 1). The required memory is less, because the large model is not duplicated. 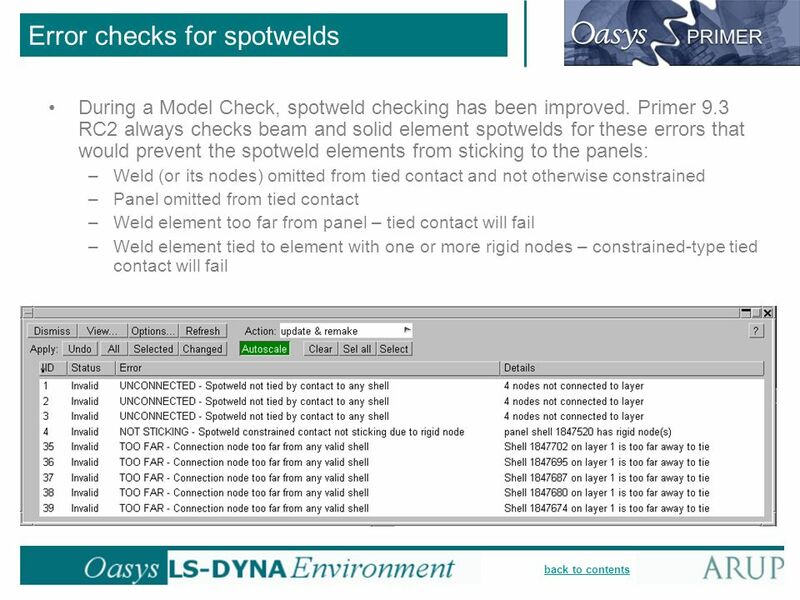 21 back to contents Error checks for spotwelds When performing a Model Check, error checks for spotwelds are performed by testing the validity of each connection. 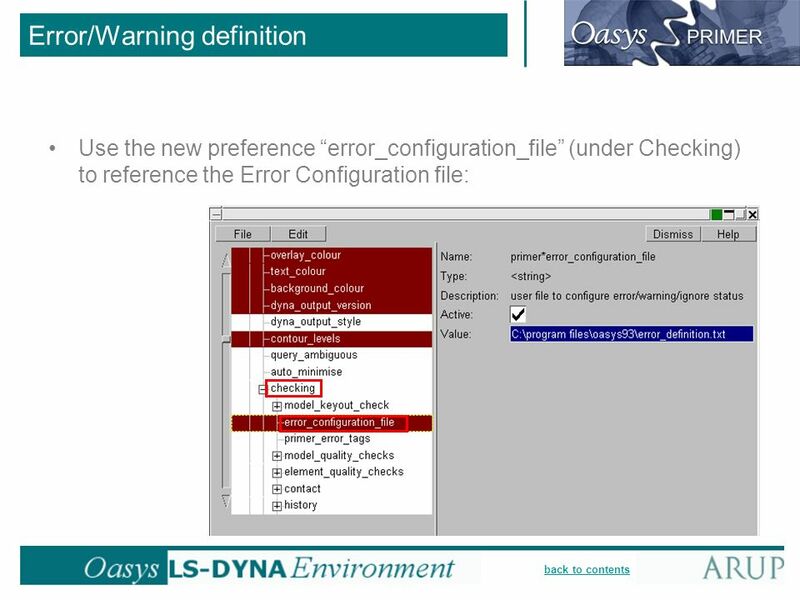 If connection entities do not already exist, they are created automatically during the checking process. 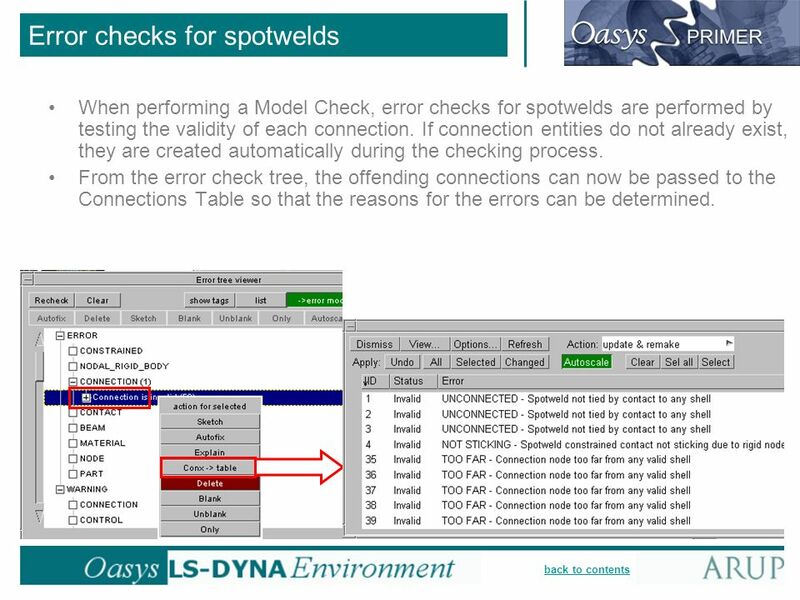 From the error check tree, the offending connections can now be passed to the Connections Table so that the reasons for the errors can be determined. 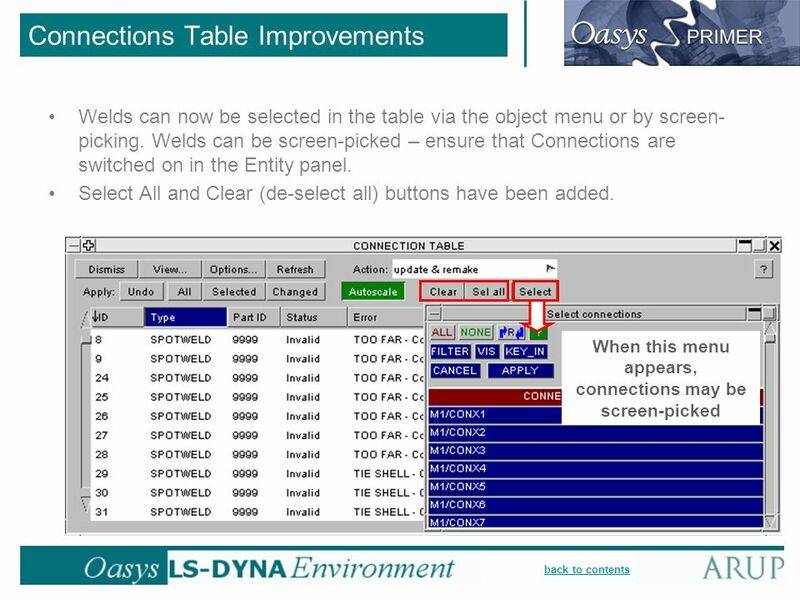 24 back to contents Connections Table Improvements The most common actions performed in the Table (Update & remake, Show connections and panels) are now accessible by right-click on selected welds. 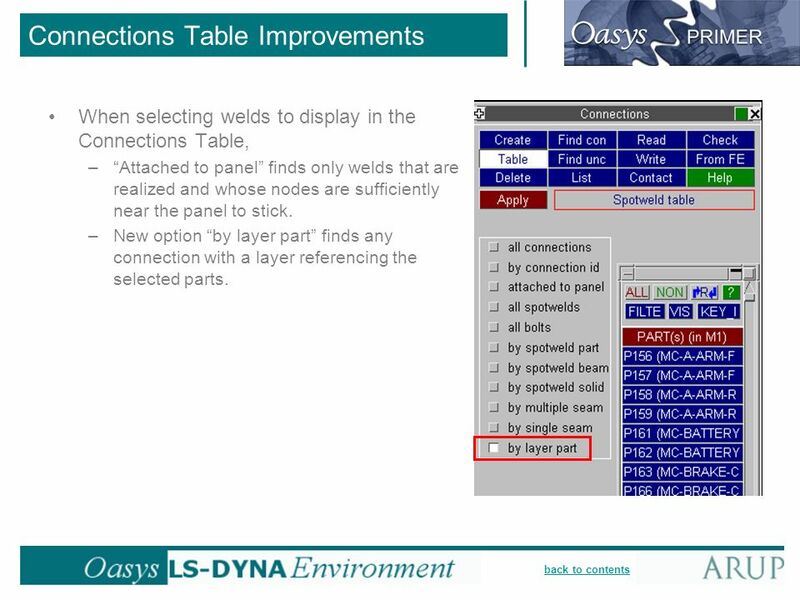 25 back to contents Connections Table Improvements When selecting welds to display in the Connections Table, –Attached to panel finds only welds that are realized and whose nodes are sufficiently near the panel to stick. 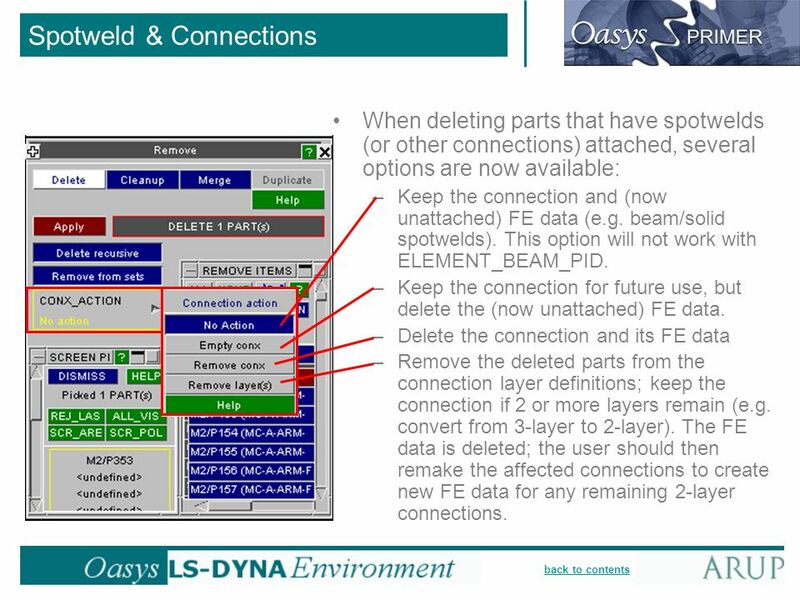 –New option by layer part finds any connection with a layer referencing the selected parts. 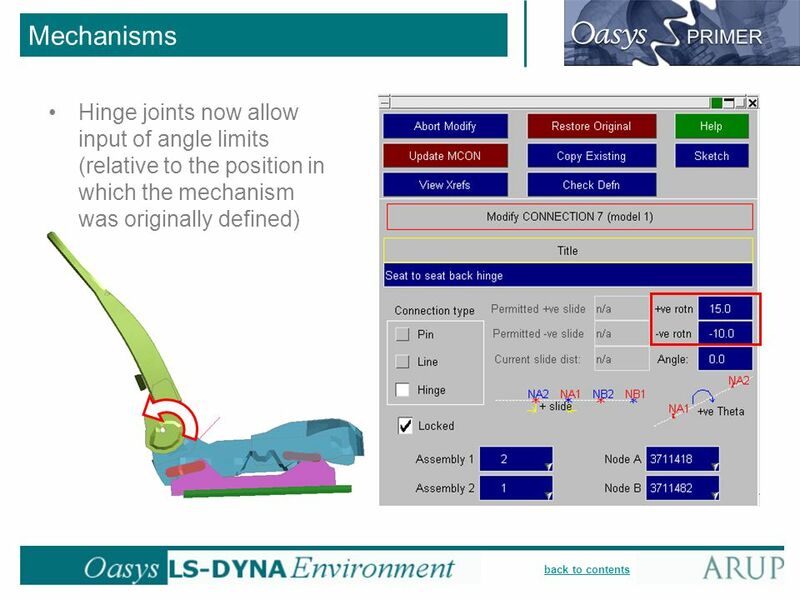 29 back to contents Mechanisms and dummies Primer 9.3 RC1 always excluded *MAT_NULL parts from Assemblies for both mechanisms and dummies, because they are frequently used to bridge across from one assembly to another – for example, they are used to prevent contacting objects from entering the gap between a dummys leg and the pelvis. 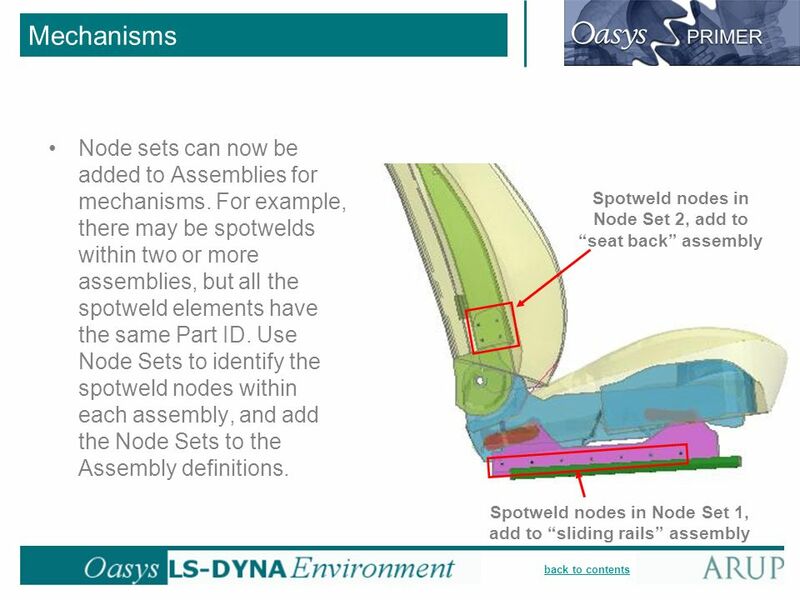 The null shells will still move with the dummy during positioning because all their nodes are shared with structural parts that are included in the Assemblies. 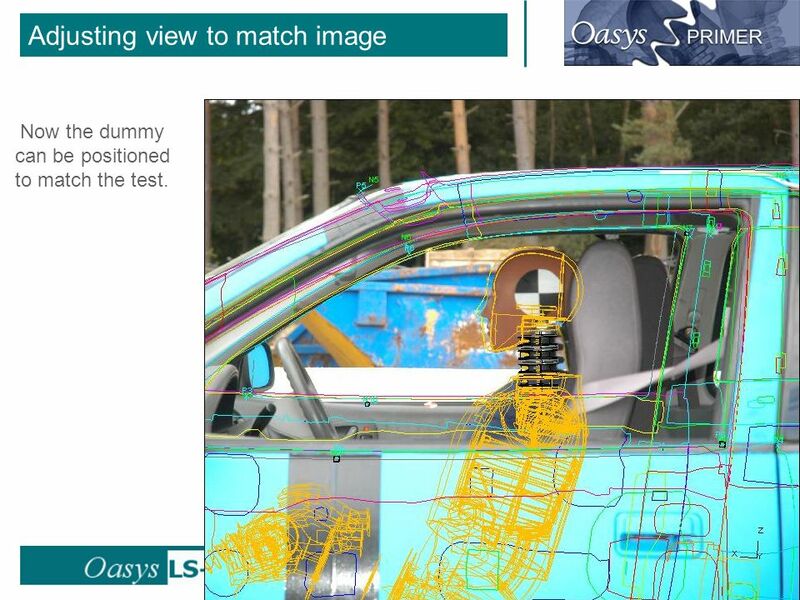 In some dummy models, target markers are meshed with *MAT_NULL shells and fixed to the dummy using a tied contact. 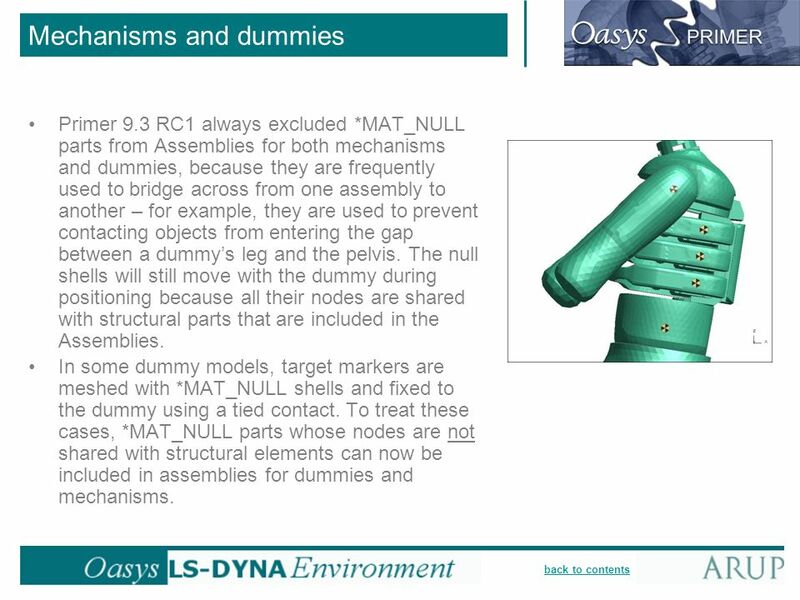 To treat these cases, *MAT_NULL parts whose nodes are not shared with structural elements can now be included in assemblies for dummies and mechanisms. 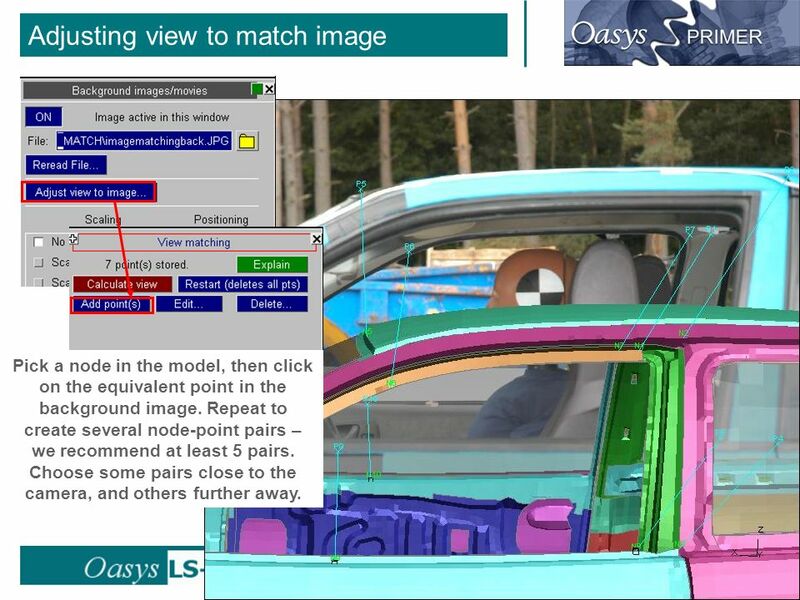 36 back to contents Adjusting view to match image Pick a node in the model, then click on the equivalent point in the background image. 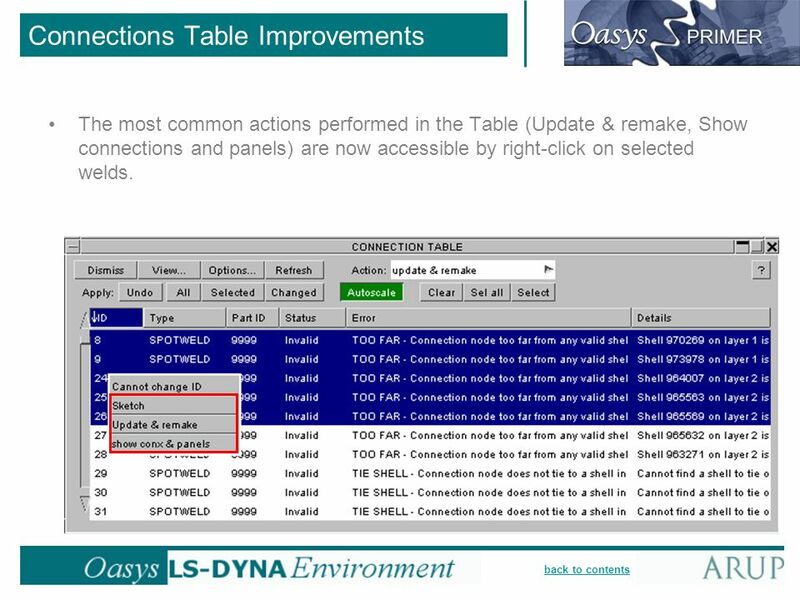 Repeat to create several node-point pairs – we recommend at least 5 pairs. Choose some pairs close to the camera, and others further away. 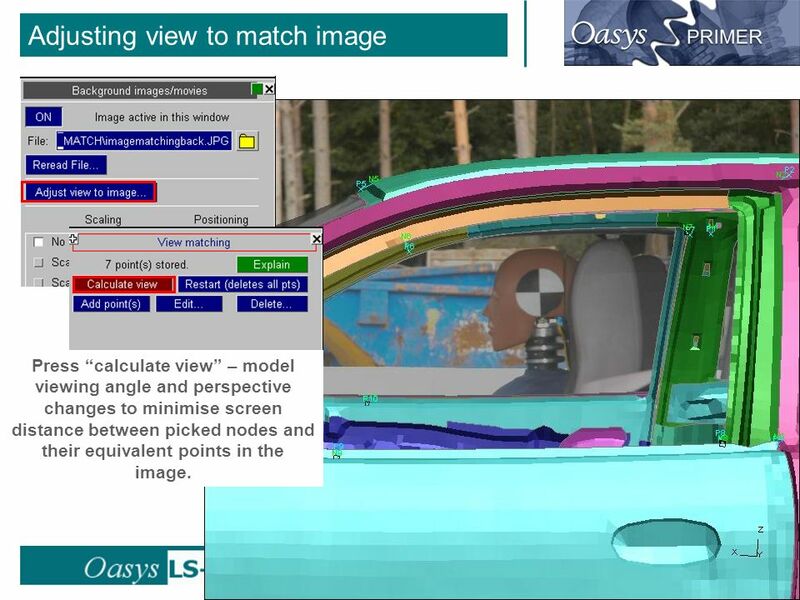 37 back to contents Adjusting view to match image Press calculate view – model viewing angle and perspective changes to minimise screen distance between picked nodes and their equivalent points in the image. 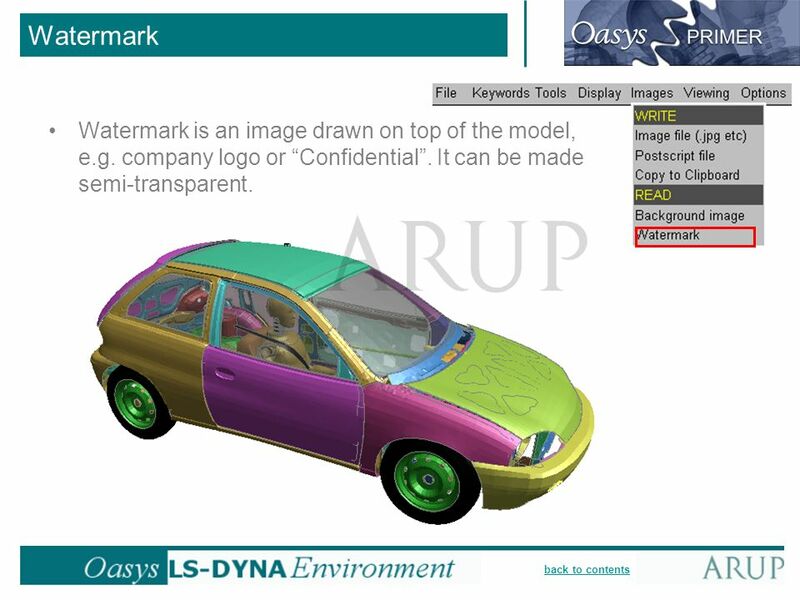 40 back to contents Watermark Watermark is an image drawn on top of the model, e.g. company logo or Confidential. It can be made semi-transparent. 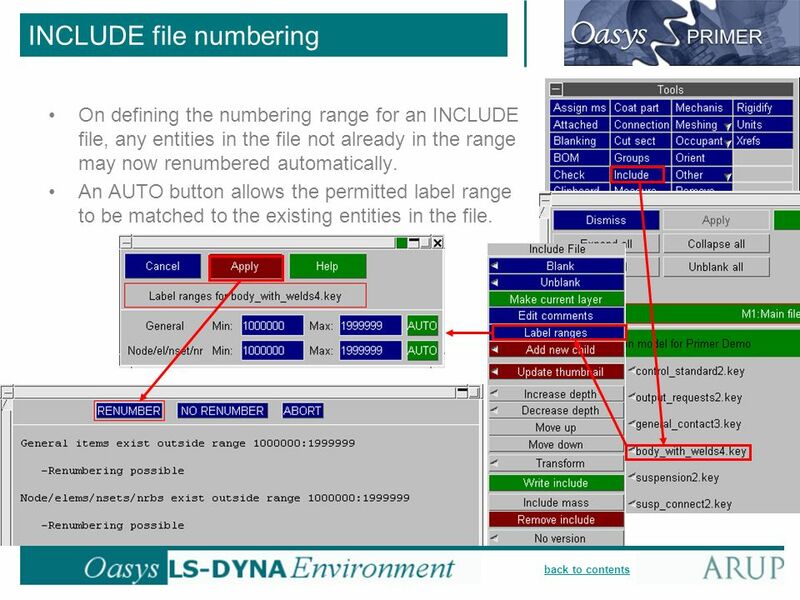 42 back to contents INCLUDE file numbering On defining the numbering range for an INCLUDE file, any entities in the file not already in the range may now renumbered automatically. 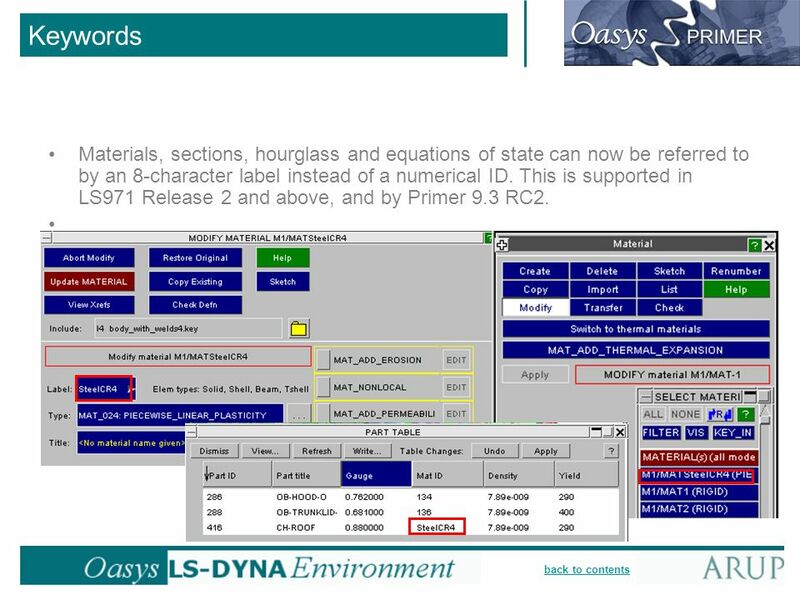 An AUTO button allows the permitted label range to be matched to the existing entities in the file. 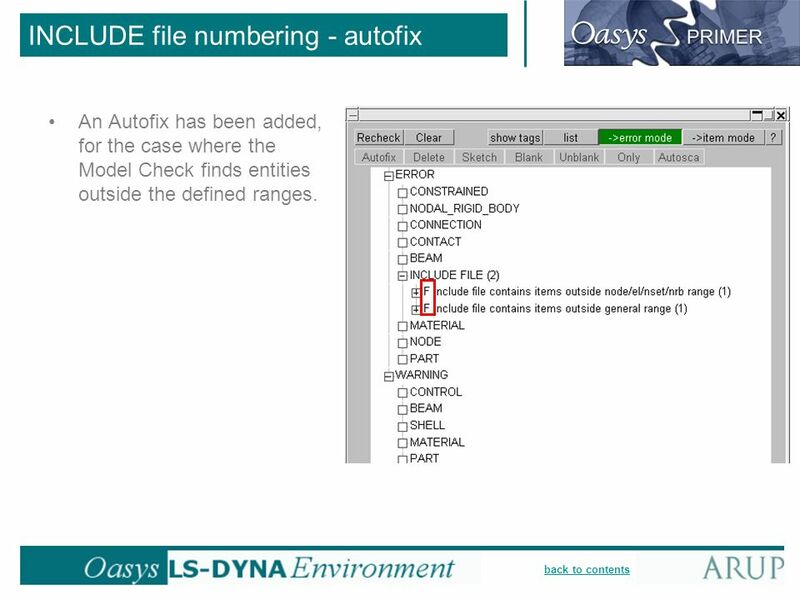 43 back to contents INCLUDE file numbering - autofix An Autofix has been added, for the case where the Model Check finds entities outside the defined ranges. 47 back to contents Number of tabs unlimited In Primer 9.3 RC1, up to 8 tabs (controlling the Docked menus) were available. In Primer 9.3 RC2, this restriction has been lifted. Arrows allow scrolling across the available tabs. 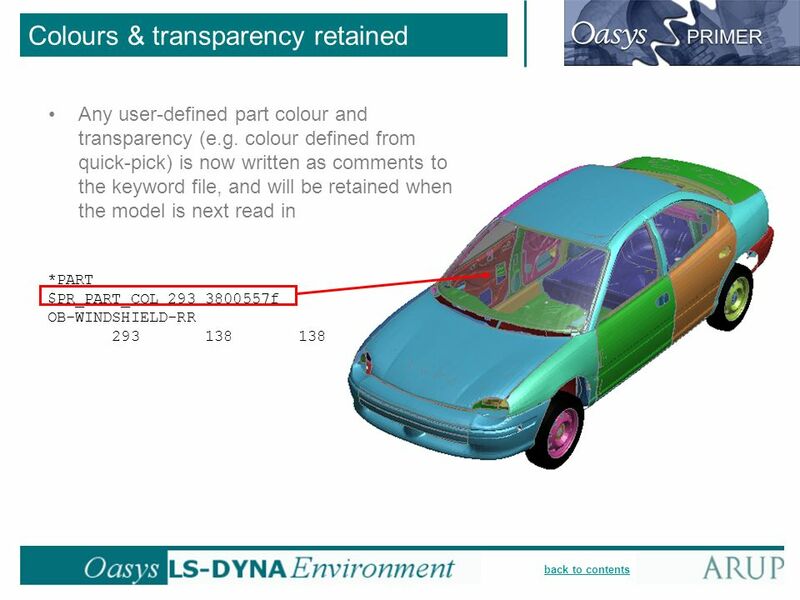 48 back to contents Current Layer for each model The Current Layer is the INCLUDE file into which newly-created entities will be put. 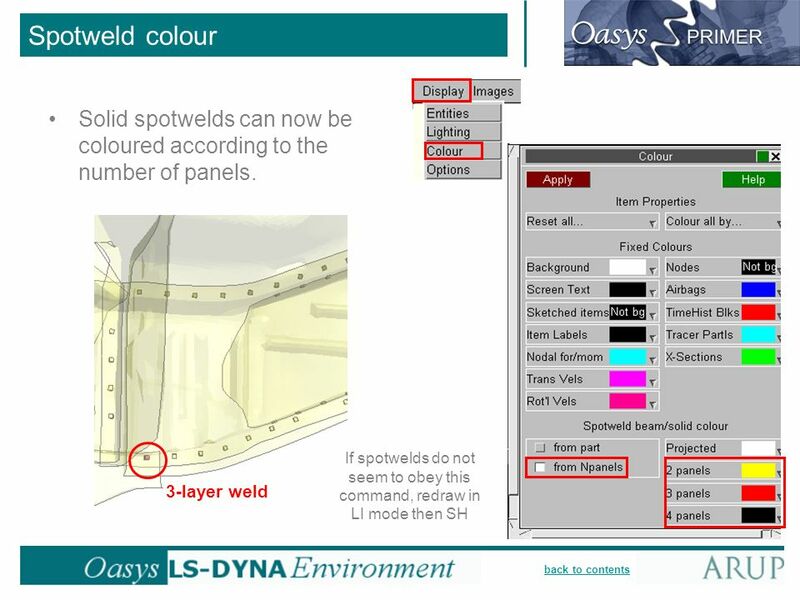 When working on multiple models, Primer now has a separate Current Layer for each model. 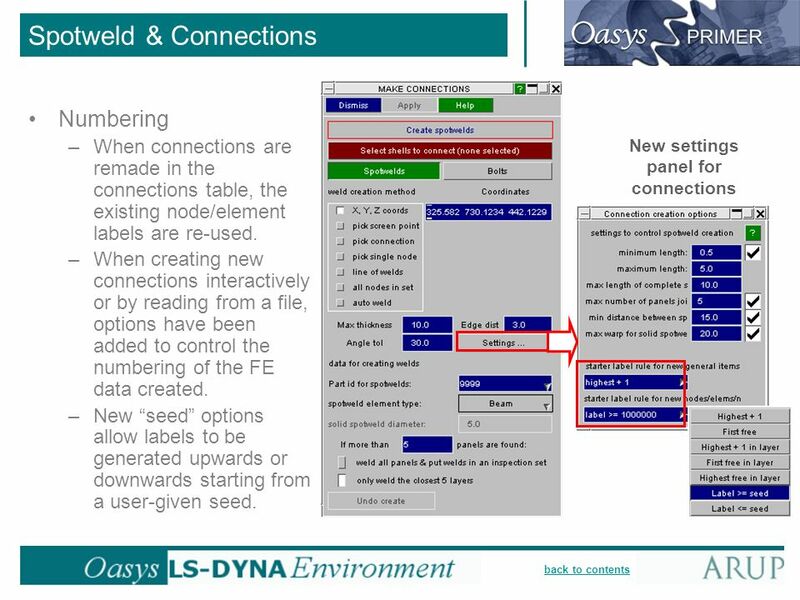 This eliminates the bad layer messages when creating data after switching between models or after deleting models. 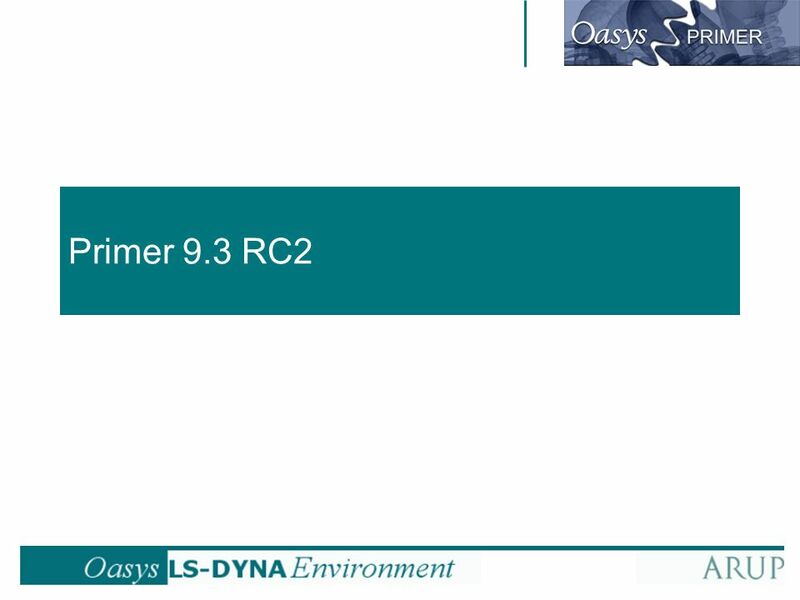 Download ppt "Primer 9.3 RC2. back to contents Primer 9.3 RC2 Purpose of Primer 9.3 RC2 LS971 Keywords *PARAMETER Model Merge improvements Customisable definition of." D3PLOT 9.3 RC1. back to contents D3plot 9.3 RC1 Open models from directory User-defined data Max and min on plots Contour options Vector plot data components. XP New Perspectives on Microsoft Office Word 2003 Tutorial 7 1 Microsoft Office Word 2003 Tutorial 7 – Collaborating With Others and Creating Web Pages. 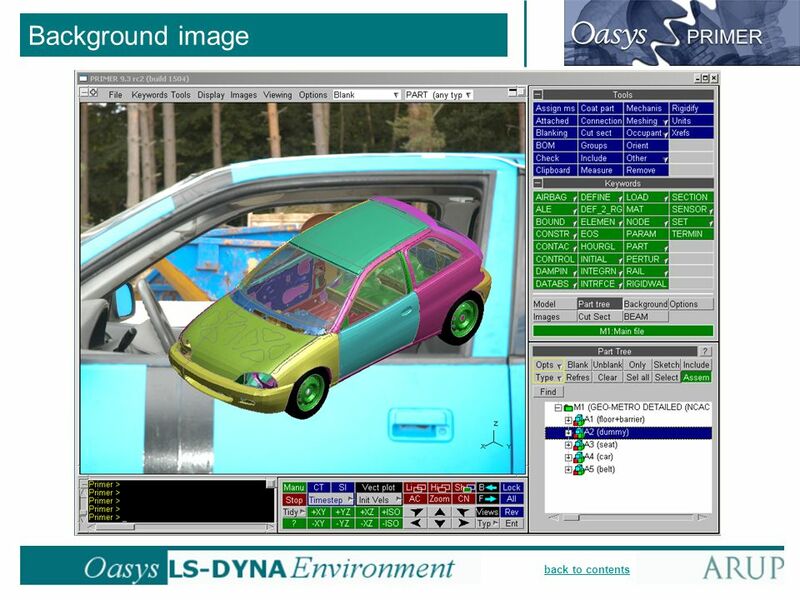 LS-DYNA ENVIRONMENT Oasys T/HIS 9.3 October 2008. Muhammad Qasim Rafique MS. EXCEL 2007.  Copyright I/O International, 2013 Visit us at: A Feature Within from Sales Rep User Friendly Maintenance – with Zip Code. © Siemens Product Lifecycle Management Software Inc. All rights reserved Siemens PLM Software Solid Edge ST4 Training Adjustable parts and assemblies. 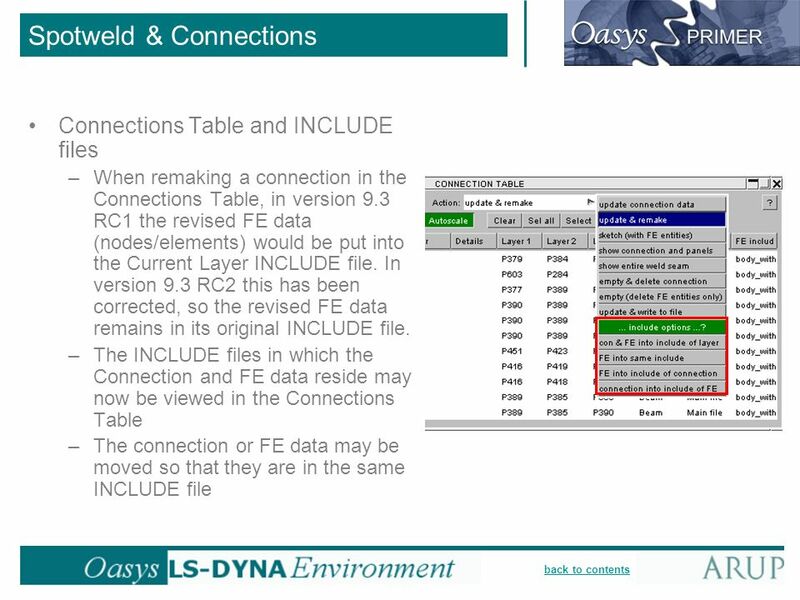 Chapter 07: Lecture Notes (CSIT 104) 1111 Exploring Microsoft Office Excel 2007 Chapter 7 Data Consolidation, Links, and Formula Auditing. Microsoft Word 2010 Lesson 1: Introduction to Word. XP New Perspectives on Microsoft Office Excel 2003, Second Edition- Tutorial 3 1 Microsoft Office Excel 2003 Tutorial 3 – Developing a Professional- Looking. 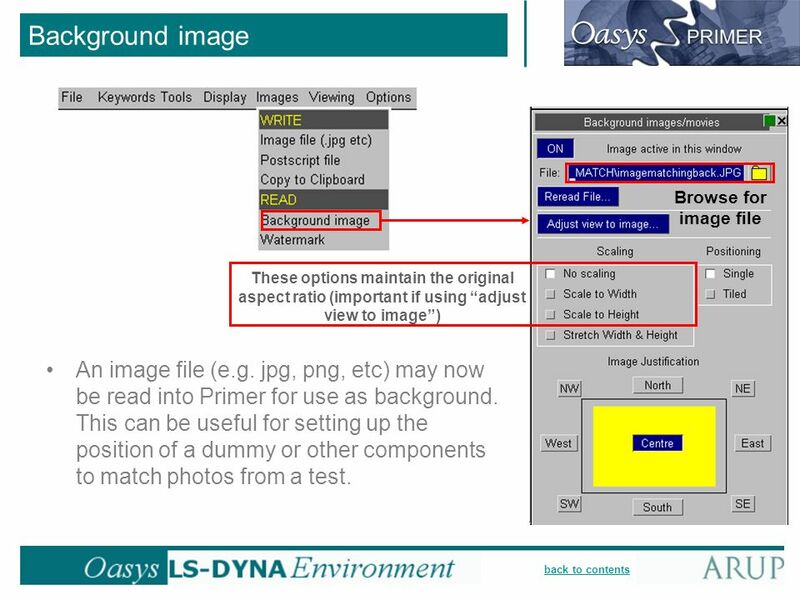 Technical Support: (989) GIS and Mapping Procedures in ArcMap 9.x Creating an ArcMap Project Editing an ArcMap Project Printing an ArcMap Project. 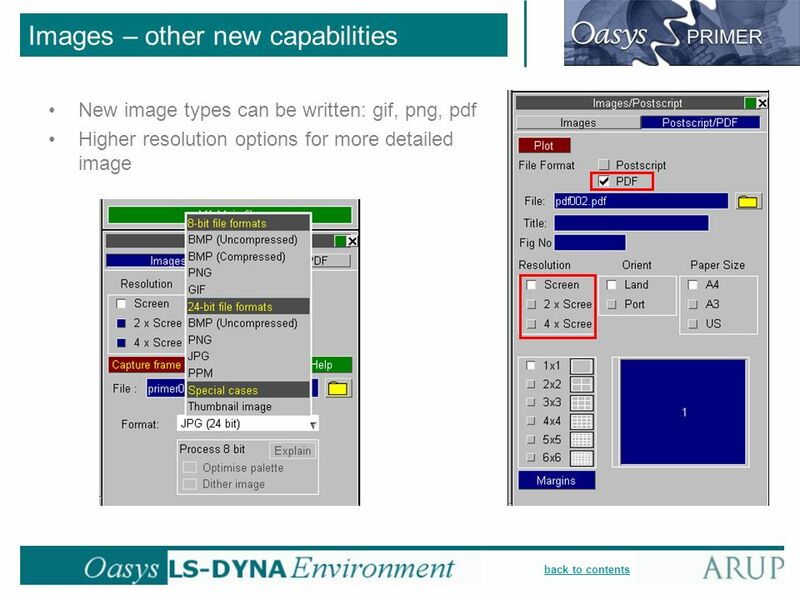 XP New Perspectives on Microsoft Office Word 2003 Tutorial 1 1 Microsoft Office Word 2003 Tutorial 1 – Creating a Document. XP 1 Microsoft Office Word 2003 Tutorial 1 – Creating a Document. E | W | E | W | NHS e-Referral Service Referring Roles Issued: 3 June.